I was very impressed with how beautiful this part of Hungary was. Passing through idyllic villages and quiet, softly colorful countryside provided a good amount of time for reflection on what the country is like outside of Budapest; outside of busy streets of trams and cars, of fashionable and fast-moving students and business-people, of the juxtaposed architecture of a changing country, and of flashing street lights, bar lights, and signs. I watched my blurry film transform, now showing brief moments of life through ornate welcome signs, low and square mellow-toned village houses adorned with box-bouquets of red and pink geraniums, wrinkled-faced men on bikes and scarfed women with baskets, old, white and simple churches, children and wild weeds carelessly going about a quiet and slow, satisfied existence. We were returning to nature and to the land of karst where families of rocks pushing up from soft mountain hills started to show along with occasional sinkholes suddenly disappearing into the underground. It's a wonderfully mixed sense of relief to leave the loud and constant busy life of responsibility and return again to the quiet and dark concentration of caves but also feel an excitement for the mystery and adventure that is in store. The Aggtelek area is a perfect place for learning rope work and cave work, not only because of the surrounding beauty, but because of the abundance and variety of several types of caves (over 700 documented so far), including relatively deep vertical pits for rigging practice. According to UNESCO's web site, these caves are somewhat unusual in providing a great demonstration of tens of millions of years of limestone karst formation including evidence of formation during the tropical and glacial climates; geological processes better documented here than anywhere else in the world. These caves also have some of the tallest stalagmites and other formations within them, however they are not as decorated as other caves of the world due to the large amount of fossilization and subsequent erosion of landscape features and subsurface groundwater routes. The leader of the vertical workshop explained these aspects and others about the area's geology in detail on our hike up to the cave entrances and showed us maps of the area as well, delineating the underground water and stream system and describing some of the topical woodland and biodiversity. If you want more details about the geology in this area however, I suggest you visit this site which is where I've retrieved a large amount of information from as well. We visited several caves on our week long tour - including the Baglyok (Cave of the Owl), Almasi, Kis Zsomboly, and the Nagy Bikkfa caves. Each cave had unique features and personalities, as well as its own specific problems for us to navigate. The students were fastidious in their determination to correctly rig each cave, using techniques learned not only from the previous few days of instruction, but from their previous years of cave work as well. 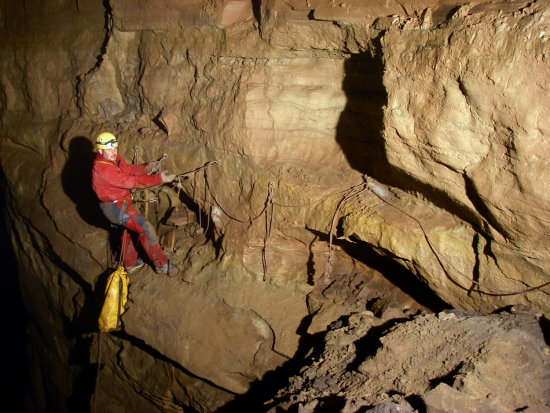 Some caves required more extensive rigging than others; for example, Denes helped one student rig a few metres-long traverse line high up in a cave using Y points of attachment at both endpoints with single points of attachment in the middle. Here is a photo of Dénes watching Lecso rig a 146 meter deep pit. I should not forget to note that we had a special treat; on the way back from the cave we made a side-trip to a beautiful little waterfall in the town of Tornagörgő (Hrhov). What is particularly notable about this place is where visitors can see the years of worn rock as the waterfall has moved, revealing tiny fossils all over the uneven rocky walls. Caving in Hungary so far has been a great experience for me; and also so far fairly different than the caves in the United States. For example after the first cave trip of the week I was convinced to move from a micro-rack device to to a Petzel Stop device because of the several change-overs, knot passes, and other maneuvers required in these caves, and I definitely did not regret it. Caving life is much easier with less to worry about. I also must admit to having had gotten very dependent on wearing several layers of fleece under my coveralls and bringing a good hat in order to keep warm. Hanging around in these caves required less energy than what I was used to - having to contort through winding and twisting horizontal passages, squeeze through long tight crawls, negotiate occasional wet mud and cold water or dry lung- filling dust, and pull and push over long uphill rock climbs in the states was not part of the trip here, and having several extra layers on while descending the ropes was critical in maintaining a happy and motivated outlook; although, of course all of these layers were shed for the way back up for sure. Hungary does have many horizontal cave systems however, and many more caves in general that involve both horizontal and vertical work as well. I'm looking forward to continuing to explore this country's several cave systems with Dénes, visiting other caves in other surrounding countries, and generally having a good time learning about geography, culture, and witnessing some of the most extraordinary and unique beauty that exists inside and outside of caves here. So until next time, boldog barlangászat!